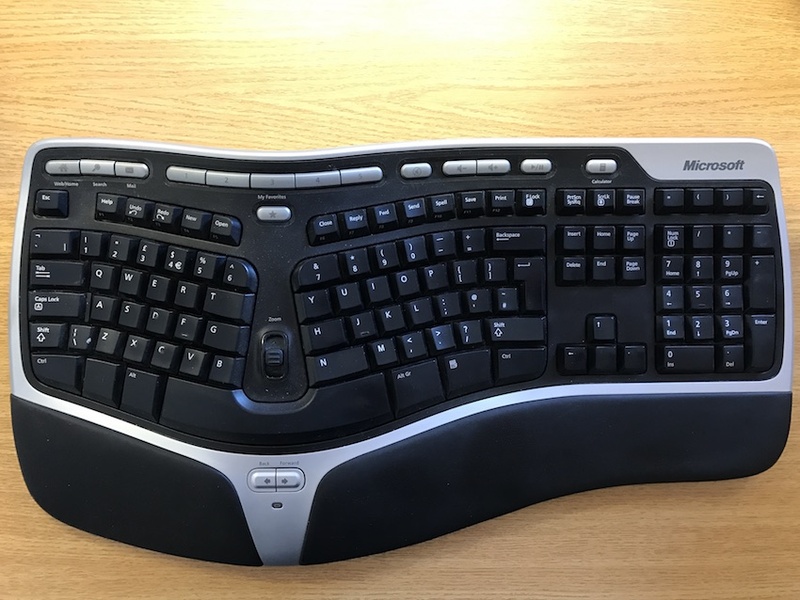 I’ve been using Microsoft’s Natural Ergonomic Keyboard 4000 keyboard at work, and the Natural Wireless Ergonomic Keyboard 7000 at home for as long as can remember. It’s always bothered me a little having the wire on my otherwise minimal desktop setup at work. 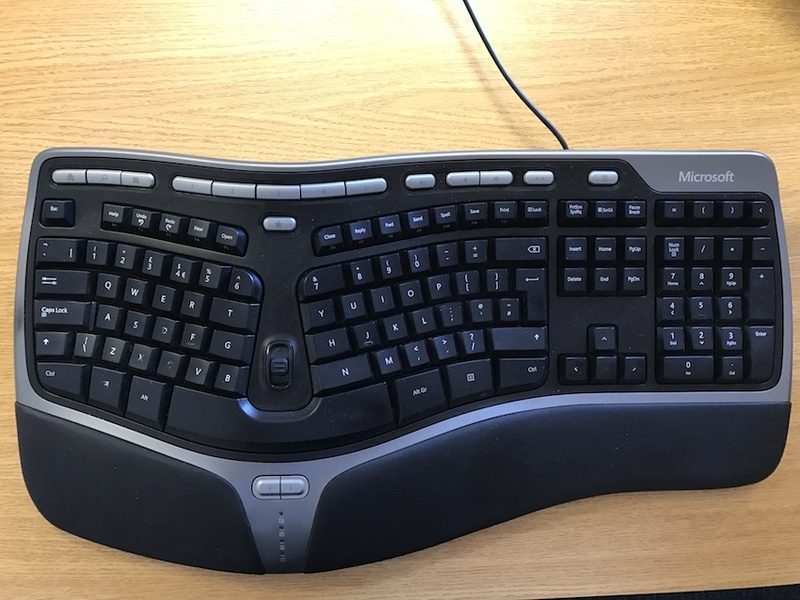 So when a colleague of mine recently started using the Microsoft Sculpt Ergonomic Keyboard it prompted thoughts of a change. Microsoft then finally launched the Surface Ergonomic Keyboard in the UK, so I ordered both and tried them out. Before I kick off the review it’s worth mentioning my perspective: I spend most of my day programming Java in Eclipse on OS X, and I also use Emacs a fair bit to navigate around log files. I work on a 2016 MacBook Pro, and have Apple headphones in most of the day so I can listen to music, do Skype calls, but still hear what’s going on in the office. This keyboard has a great layout, with the integrated number pad and dedicated buttons for volume control. In the office I often use the mute button when I need to quickly tune into a conversation that’s going on around me. After trying the Sculpt and Surface keyboards and coming back to this, I found the keys to be really clunky and have way to much travel on them. It really feels hard going after using one of the more modern keyboards. It’s also frustrating that the wireless model has been discontinued. I did monitor eBay for a while, but a new one with a UK layout never came up. At only £33 on Amazon this is a still great value keyboard. Exactly the same as the 4000, but wireless. As this is now discontinued so I won’t consider it for this review. This keyboard looks fantastic. It’s small, black, and looks great on my desk. The keys are super snappy making typing a breeze. It does however miss the number pad. 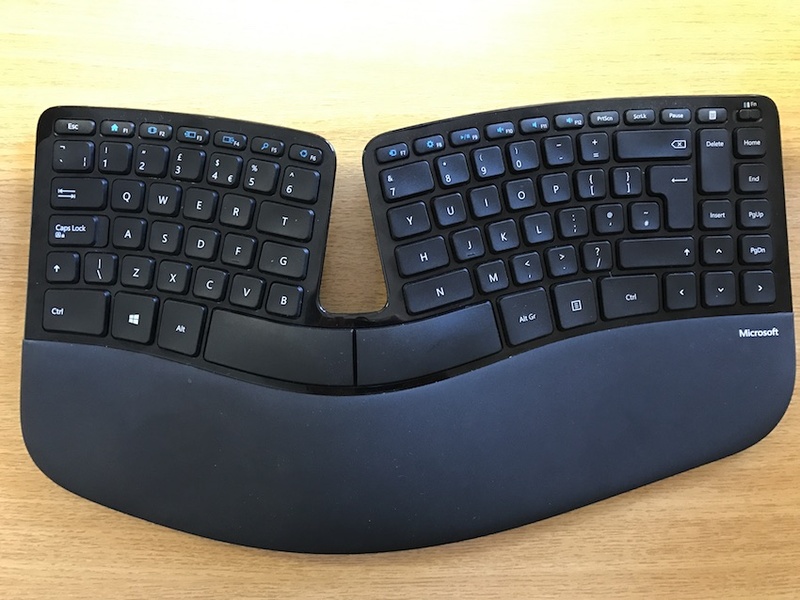 You can use the separate one that comes with the keyboard but when I tried this I found myself knocking into it and flipping it over. The function keys are a really odd shape, I wish there were just normal keys like on the other two keyboards. The extra functions keys have been removed and replaced by making the traditional functions keys multi purpose by use of a switch in the top right of the keyboard. This is a bit clunky as my one touch mute has now become an awkward switch slide and then a mute. I think this is fairly priced at £63.05 on Amazon, which includes the separate number pad and a mouse (I don’t use the mouse, I’m sticking with my Logitech M510). The layout is very similar to the Ergonomic keyboard and has an integrated number pad. The keys have a much shorter travel than the Ergonomic, but are not as nice and snappy as the Sculpt. The keys also have slightly sharp edges, which can make it a little uncomfortable at times. Rather than using USB wireless, the keyboard uses Bluetooth. This is great as it’s one less receiver in my USB hub, but unfortunately the Bluetooth connection doesn’t work great with my Mac when it sleeps. I can’t use the keyboard to wake it despite having all the options set to allow Bluetooth wake in OS X. I have to use either my laptop keyboard, or my mouse. Normally, once the computer has woken the keyboard will reconnect automatically, however sometimes I do have go into the bluetooth settings to force a reconnection, which is really frustrating. Like the Sculpt there are no dedicated smart keys, they are again combined with the standard functions keys. 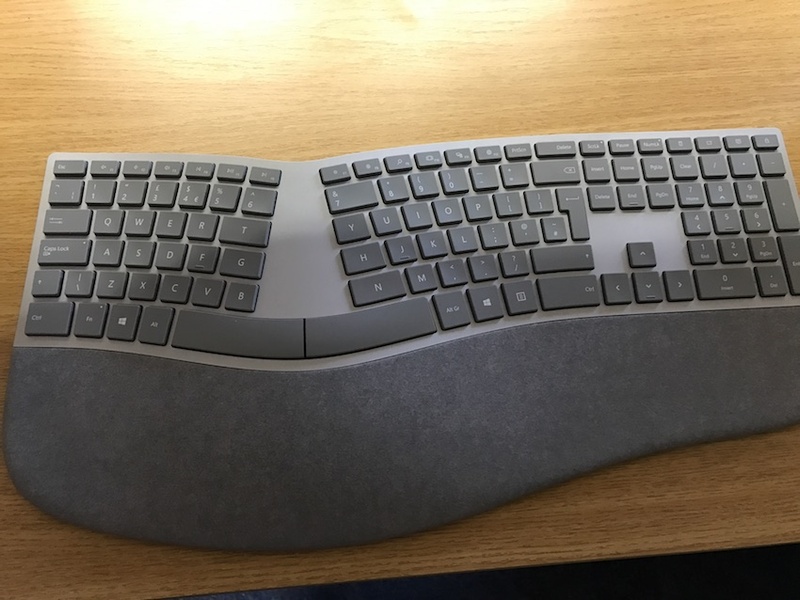 Microsoft describe the keyboard as being “in stunning two-tone grey mélange Alcantara”, personally I’d rather they’d gone with black, this looks a bit dull to me. At £119, only available from Microsoft, this really is a super expensive keyboard. After trying both the modern keyboards out I knew it was time for a change. So it was really between the Sculpt and Surface. I’ve decided to go with the Sculpt primarily for the feel of the keyboard. It’s so nice to type on, the keys really are fantastic. Whilst I did like having the number pad on the Surface, the Bluetooth issues really were an annoyance. If I could have some input into the next keyboard Microsoft did it would be this: Start with the Sculpt, make the function keys real keys, add some hot keys, offer an option with an integration number pad, add a little more padding to the bottom of the palm rest. I’ve finally realised/noticed what it is about the Sculpt that is so much nicer than the Surface. The keys on the Sculpt have a little dip in the middle, allowing you to “anchor” your fingers in place, and the edges of the keys are also rounded slightly. The keys on the Surface are flat, which, although it’s only a tiny detail, makes you feel less connected to the keyboard. 2 months into using the Sculpt I’m delighted with my choice.